Everything Just Sew: My creative space - an external all-in-one facing tutorial. My creative space - an external all-in-one facing tutorial. I'm visiting Kootoyoo's Creative Spaces again this week - so much fun to peek into everyone else's! My creative space is full of stuff in various stages of completion, so I thought I'd take the opportunity to demonstrate my way of doing an all in one facing, expertly demonstrated by Sherry recently. 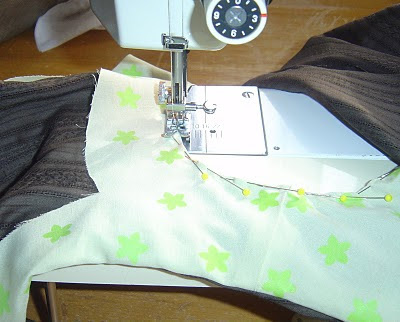 Her method works for pretty much all applications, mine only when there is a centre front or back opening in your garment, and wide enough shoulder straps. I find it easier, so I thought I'd show it here in case anyone else might benefit! As mentioned, the garment must have an opening in CF or CB. 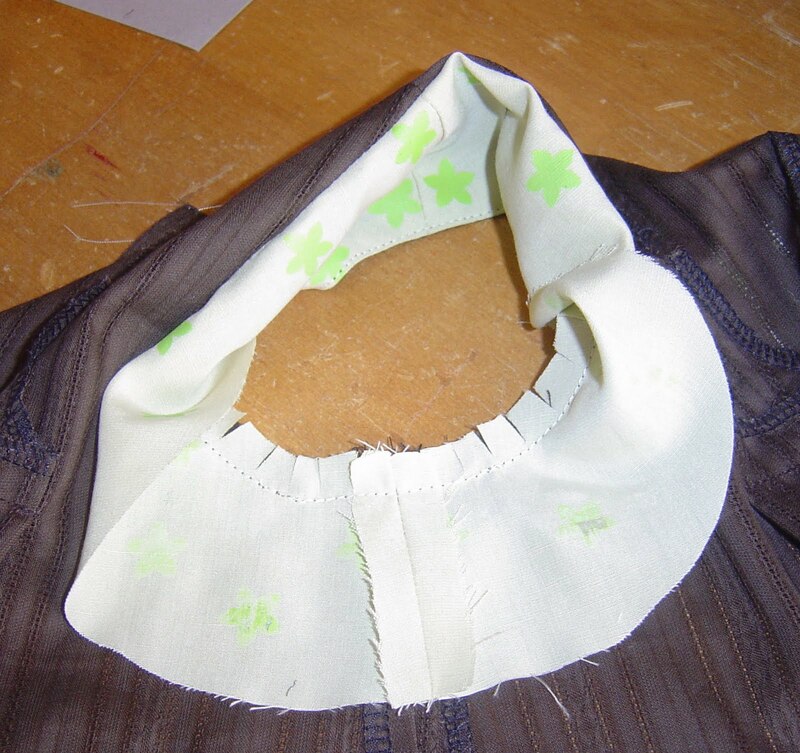 Begin by sewing the shoulder seams of garment and facing and press them open. 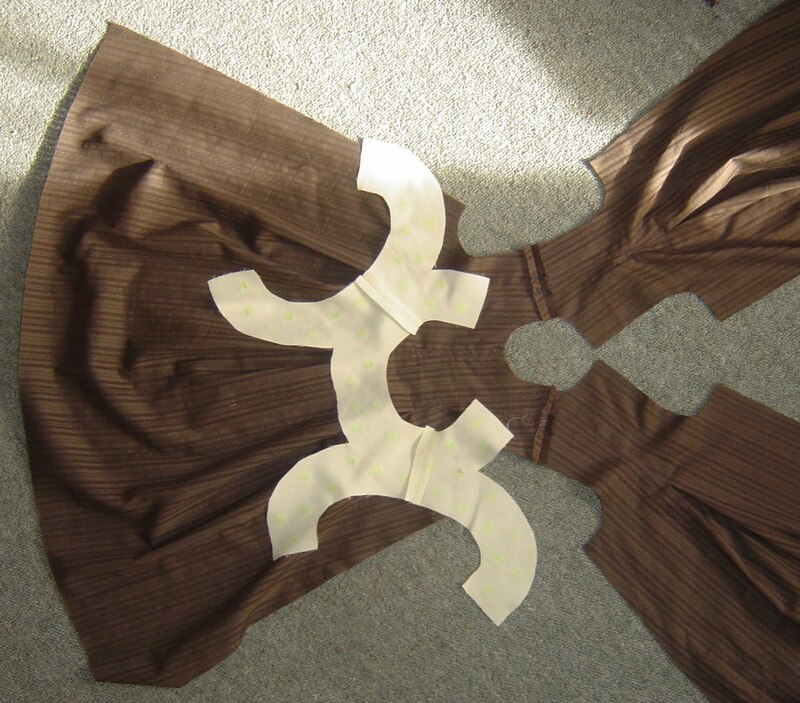 Since my facing is going to be on the outside I've sewn the dress with wrong sides together and facing with right sides together. This means the seams will all be enclosed when the dress is finished. 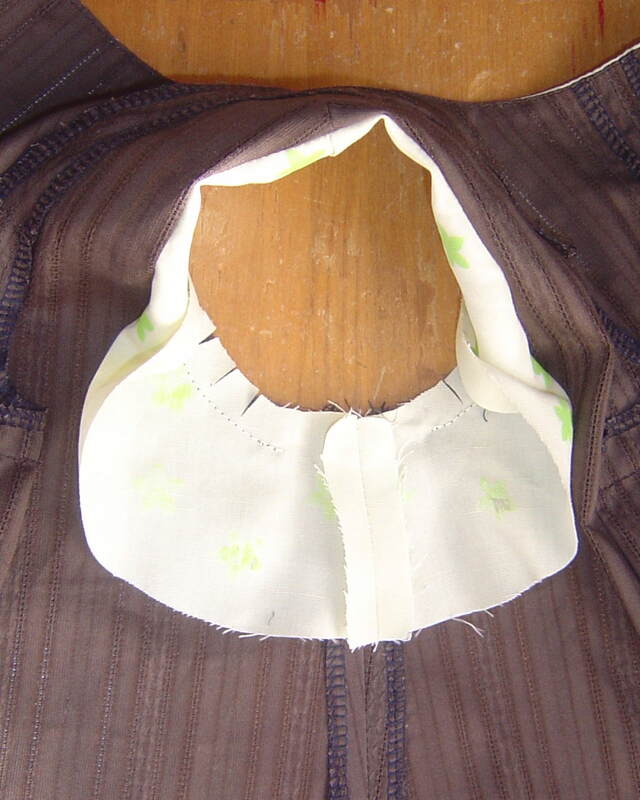 Then sew the facing to the garment around the neckline and armholes. 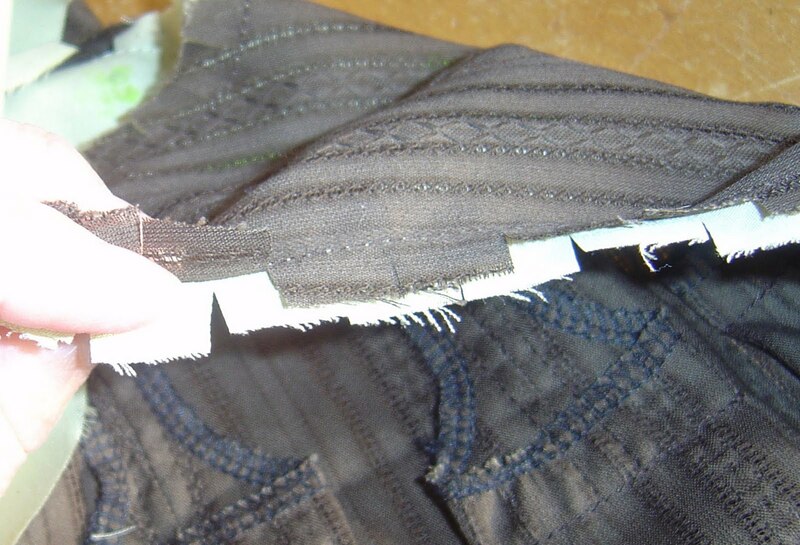 If you're inserting a zip, leave about 3cm unsewn at the CB edge. I'm not so I sewed it right to the edge. 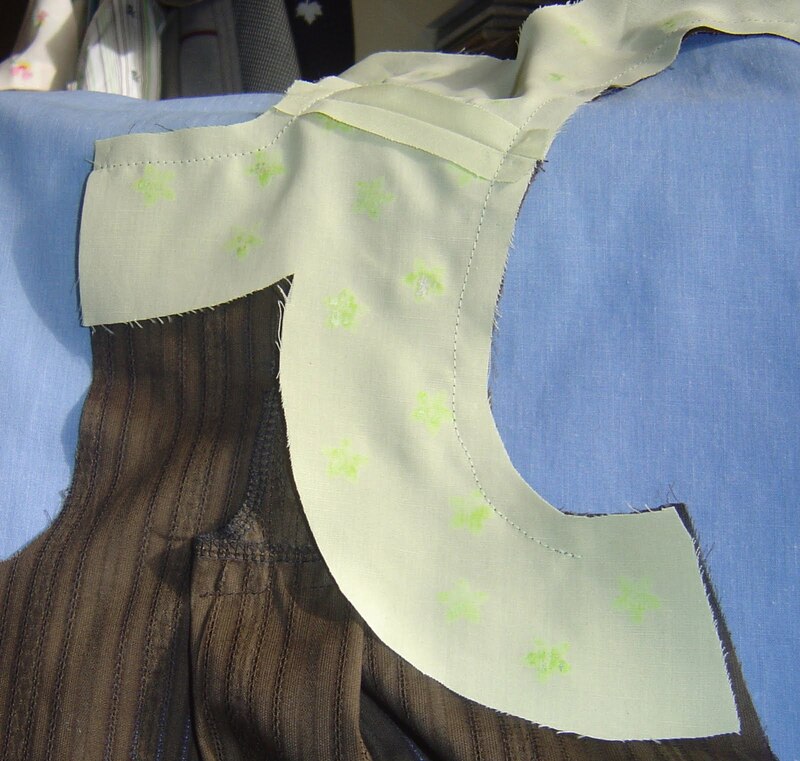 Most importantly, leave about 3cm unsewn at the armhole edges. Clip the curves so they'll turn evenly. I always offset my clips so that where the "Vs" form by opening out a curve they aren't in the same place on garment and facing seam allwances. This makes for a smoother edge. 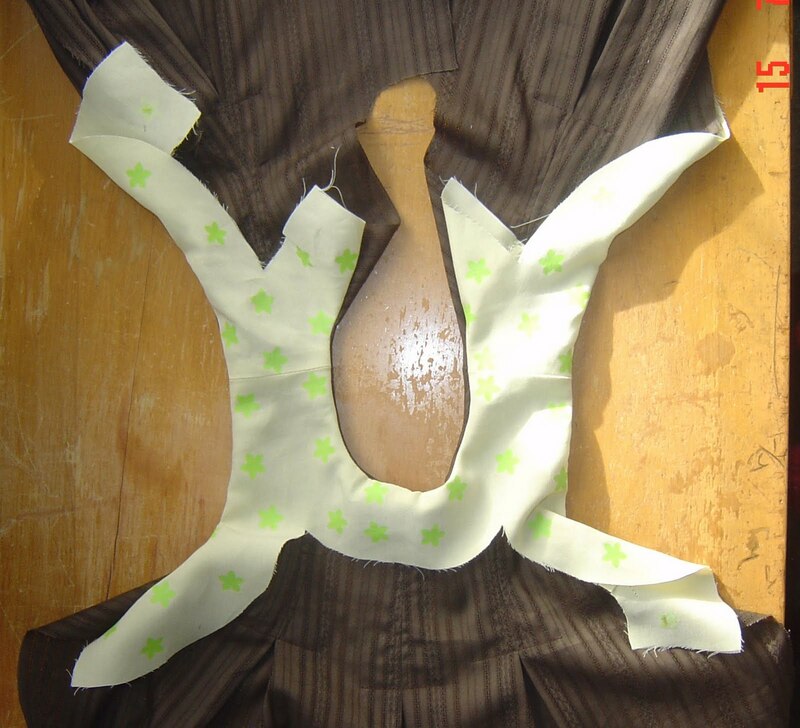 Then turn the garment right side out by pulling the backs through the shoulders. At this point I pin and edgestitch my neckline because it's easier when it's flat and the way my CB opening is finished won't be affected by it being done now. Next sew the side seams of garment and facing, and press them open. Then finish sewing the facing to the garment around the bit of armhole left unsewn, and finish clipping the curves. 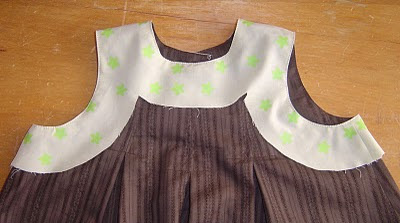 After edgestitching the armholes, it looks like this. Last of all the seam allowance on the lower edge of the facing is pinned and stitched down. After one final press, here it is. 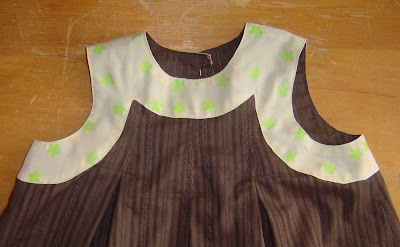 I really like these external facings on dresses I make for children since they give a lovely smooth finish inside, and a nice lift to a plain design. Oh it looks very complicated! I will have to remember the tut when I come to do one later on! Well done to you for mastering it! Clever post and thanks. I love the external facing too. This is a nice easy way of bagging out the neck and armholes. I usually put my zip in first, but will try this next time I have it open! Thank you so much, i've been browsing so many all in one facing tutorials, but either they are somehow incorrect (leaving the shoulder seams sewn last and visible) but yours is exactly how my prof taught me, and this is a great reference with great pictures. Thank you again!